This undated photo was probably taken in New York City some time before Leah passed away in 1918. Morris Cohen, the oldest surviving son of Leah Fein and Dov Ber Cohen, was born in Kupiskis in 1868. He died in New York City in 1948. Morris decided to return to Kupiskis to live sometime during either the late 1920's or early 1930's but discovered that he no longer 'fit in' and returned 'home' to New York after about a year. Meyer Cohen, born in Kupiskis in 1870, was the second son of Leah Fein and Dov Ber Cohen. He emigrated to New York c.1892 and spent the majority of his life in the fruit business in Morristown, New Jersey, where he died in 1958. This photo shows him, c.1900, in front of his wagon which he used to peddle fruit before he was prosperous enough to open up a shop in Morristown. 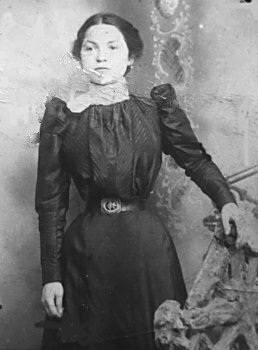 Ida (Chaya) Cohen Cantor was born in Kupiskis in 1880 and came to New York with her parents, Leah Fein and Dov Ber Cohen in 1893. In 1900 she met and married Samuel (Shimson Ber) Cantor, who was born in 1872 in Uzpaliai, only twenty or so miles from Kupiskis. Ida and Sam ran a grocery store in Brooklyn for many years. He died in 1952 and she died in 1966. Their youngest grandchild, Linda, is your webmaster. The photo of Ida was taken in 1900 for her engagement to Sam. The photo of the two of them was taken about 1910, probably in Norfolk, Virginia, where they lived for several years before returning to New York. 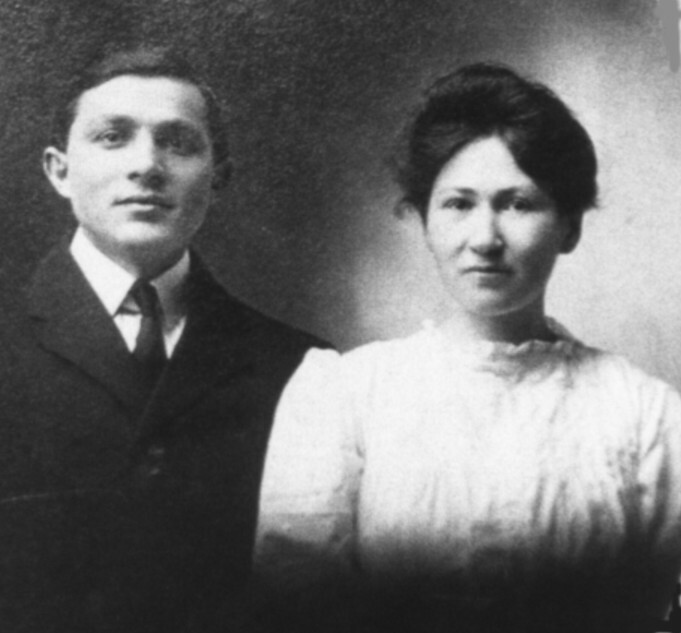 Jenny Cohen Lipschutz, the youngest surviving child of Leah Fein and Dov Ber Cohen, was born in Kupiskis in 1884 and came to New York with her parents in 1893. She married Abraham Lipschutz in New York. Abe, born in Kupiskis in 1882, was the son of Hannah Trapido and Samuel Lipschitz. The photo of Jenny is undated but would appear to be taken about 1900 and the photo of Jenny and Abe was taken in 1910 in Norfolk, Virginia, where they lived for several years before returning to New York City.